Day-Lewis...wears well the weariness of the office and Lincoln's puckish yet subdued sense of humor, scaling the man closer to life-size than Mount Rushmore monumental. 150 min. DreamWorks Pictures. Director: Steven Spielberg. Cast: Daniel Day-Lewis, Sally Field, Tommy Lee Jones, Joseph Gordon-Levitt, David Strathairn. Lincoln was promoted as the child of three parents—star Daniel Day-Lewis, screenwriter Tony Kushner, and director Steven Spielberg—and no one will be asking for a DNA test to verify that parentage. Despite the importance of many other individuals (supporting actors like Tommy Lee Jones, Team of Rivals: The Political Genius of Abraham Lincoln author Doris Kearns Goodwin, and Lincoln himself), the film works to the degree that it does based on the merits (and missteps) of those three individuals. Day-Lewis earned a record-breaking third Best Actor Oscar for his work, and deservingly so: his is a performance of consummate craft: intense research, blessed imagination, and total immersion into character. As the sixteenth U.S. president, Day-Lewis depicts the determination of Lincoln to heal a fractured union through his leadership, but he also wears well the weariness of the office and Lincoln's puckish yet subdued sense of humor, scaling the man closer to life-size than Mount Rushmore monumental. This may be a great man, but he is certainly a human one, an impression abetted by Day-Lewis' wise choice to eschew the stentorian and adopt a reedy regional dialect appropriate to a man from Kentucky and Illinois (also note his nonprecious physicality, lying on the ground with his son or crawling on all fours to stoke the fire). Day-Lewis savors Lincoln's words and Kushner's, the latter showcased in a splendid monologue from the President to his cabinet. Kushner, whose script is "based in part on" Goodwin's book, probably deserves the most credit for the film: according to fresh Hollywood legend, his original draft—more expansively covering the last four months of Lincoln's life—clocked in at around five hundred pages before intensive editing whittled it down to a focus on the two-month period leading up to the passage of the Thirteenth Amendment, which outlawed slavery. Given this focus, the film would have been better served by sticking to it under a title like "The Final Push." Instead, the film needlessly tacks on Lincoln's assassination, and has justifiably drawn ire for overstating Lincoln's importance in abolishing slavery while effectively (white? )washing out the abolitionist movement, including its prominent African-American voices. To be fair, a movie about the abolitionist movement would be an entirely different one—almost certainly a better one, a more important one, but also a commercially improbable one. Looking at Lincoln for what it is reveals a surprisingly wonky movie brought into the marketplace under the aegis of awards-season prestige and the excitement, such as it is demographically, that can be generated by the names "Daniel Day-Lewis" and "Steven Spielberg." As scripted by Kushner, better known as a Pulitzer Prize-winning playwright, Lincoln is defiantly talky. It's sort of a "profile in courage" but more so a profile in legislative sausage being made. Throw in Lincoln's homespun instructive anecdotes and metaphors, and domestic spats with Mary Todd Lincoln (Sally Field, deftly dancing up and down the anxiety spectrum) and Robert Lincoln (Joseph Gordon-Levitt), and you get something that starts to resemble The West Wing, circa 1865. As for the ever-populist Spielberg, he obviously served as a necessary leader to get the film made, and as per auteur theory (and Presidential parlance), the buck stops with him. So Spielberg gets credit and takes blame for a classy production—with top-notch production and costume design by, respectively, Rick Carter and Joanna Johnston—that's also a bit overproduced (Janusz Kaminski's artificial cinematography, which draws attention to itself). The film's worst scenes constitute Spielbergian interpolations so obvious they light up like cancer cells on a CT scan: the first scene of Lincoln—meeting with black soldiers—and a later one with Elizabeth Keckley (Gloria Reuben) feel like "here come the airplane" pablum spoon-fed to the mass audience (see, black people were around) that cause a disturbance in the film's "This is history" force. Spielberg's finesse in chasing mass appeal has diminished in recent years, but that fault isn't enough to blight the whole film, which is better defined by the legislative and extra-legislative debating and wrangling (and palm-greasing) on the way to the Thirteenth Amendment. Surprisingly, Lincoln is largely a film about the necessity of compromise in producing dramatic political change, and the sad truth that some of that compromise impeachably involves personal ethics. That's not a view of this period of history commonly taken by Hollywood, and Kushner's intellectual approach to making drama of lawmaking proves most welcome, not least to actors like Jones (splendid as grumpy Radical Republican abolitionist Congressional leader Thaddeus Steven), James Spader (as party operative William N. Bilbo), David Strathairn (as Secretary of State William H. Seward), Hal Holbrook (as Francis Preston Blair), among many, many others in the sprawling, superior cast. Lincoln winds up being not so much an exciting work of cinema, but it is a stolid one, advancing the longstanding screen presence of Lincoln in the popular imagination, as framed by a world-famous filmmaker, a keen writer, and a brilliant actor. Disney brings Lincoln to home video in a few flavors, including an impressive 4-disc Blu-ray + DVD + Digital Copy combo pack special edition. The A/V treatment afforded the film doesn't miss a trick. The film-to-digital transfer is clean and nuanced in reproducing cinematographer's Janusz Kaminski's period feel, achieved in part by sometimes hazy or blown-out photography. that's not to say the image is less than handsome, but it does have a purposefully unnatural look in its color filtering and soft edges. The disc reproduces it all entirely faithfully, with rock-solid black level, strong texture, and true hues. There can be no complaints with the audio here, either, as it comes in a lossless DTS-HD Master Audio 7.1 surround mix that's playing with plenty more digital processing power than the audio needs to be effective. Rest assured, every bit of dialogue and every ambient detail in the film's subtly immersive mix comes through with crystal clarity. 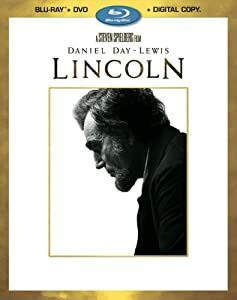 The first Blu-ray disc includes "The Journey to Lincoln" (9:24, HD), a swift behind-the-scenes overview that includes comments from director Steven Spielberg and star Daniel Day-Lewis, and "A Historic Tapestry: Richmond, Virginia" (4:00, HD), which contextualizes and depicts location filming. The second disc offers somewhat more expansive behind-the-scenes goodies, starting with Blu-exclusive featurette "In the Company of Character" (10:23, HD). Day-Lewis, Sally Field, Tommy Lee Jones, David Strathairn, and Joseph Gordon Levitt participate, discussing their casting, and their understanding and approach to their characters. Blu-exclusive "Crafting the Past" (10:43, HD) examines production design, costume design, and makeup. Blu-exclusive "Living with Lincoln" (27:04, HD) comes the closest to a making-of doc, with its quantity of set footage and interview subjects (including Spielberg) focusing on production. "In Lincoln’s Footsteps" (16:35, HD) cleans up with editing, sound design and recording, and the composing of John Williams, in addition to a look at wrapping the film's story and the film itself. taken together, the bonus features in this set amount to well over an hour of making-of material covering most aspects of pre-production, production and post-production. All site content © 2000-2019 Peter Canavese. Page generated at 04/18/2019 11:36:04PM.